Now that you have reached this web page, it means that you are interested, or contemplating traveling to Costa Rica to receive dental care. If so, you have to know that you have arrived at the right place, here we can help you to have a better idea of ​​the prices of dental procedures in Costa Rica. We have created this website in collaboration with the dental tourism specialists of Costa Rica Dental Tourism Guide, for your peace of mind. We have set ourselves the task of completing an extensive list of dental procedures by analyzing the prices of the top 10 dental clinics in Costa Rica. At the same time you can give you an idea of ​​how long each dental procedure will last in Costa Rica. In the following list you will be able to find, the name of the procedure, an estimate of the price that would cost you if you perform that dental procedure in Costa Rica, and the estimated price that would cost if you do it in Costa Rica. We hope that this list will work as a valuable resource for all those North American and Canadian citizens who every year prefer to travel outside the USA to practice their dental procedures. Also, we have to give you a second motivation, because in addition to the good dental prices that you will find in Costa Rica for your dental procedures, you will also have the opportunity to travel and get to know a little about this wonderful country. If you are already completely decided, start packing and take a trip to Costa Rica … Your desire to have an enviable smile and raise your self-esteem can be a reality in Costa Rica. How Much Does Dental Care Cost in Costa Rica Compared to the US or Canada? Dental Procedure: Composite Filling: USA Price: $202 USD vs Costa Rica Dental Prices: $90 USD | Procedure Duration: 1 day. Dental Procedure: Composite Filling (1 surface) : USA Price: $130 USD vs Costa Rica Dental Prices: $80 USD | Procedure Duration: 1 day. Dental Procedure: Composite Filling (2 surface) : USA Price: $150 USD vs Costa Rica Dental Prices: $100 USD | Procedure Duration: 1 day. Dental Procedure: Composite Filling (3 surface) : USA Price: $170 USD vs Costa Rica Dental Prices: $120 USD | Procedure Duration: 1 day. Dental Procedure: Deep Cleaning, Scaling & Root Planing (per quadrant) : USA Price: $200 USD vs Costa Rica Dental Prices: $140 USD | Procedure Duration: 1 day. Dental Procedure: Extraction (simple) : USA Price: $175 USD vs Costa Rica Dental Prices: $90 USD | Procedure Duration: 1 day. Dental Procedure: Extraction (surgical or impacted) : USA Price: $679 USD vs Costa Rica Dental Prices: $220 USD | Procedure Duration: 1 day. Dental Procedure: Inlay/Onlay : USA Price: $900 USD vs Costa Rica Dental Prices: $400 USD | Procedure Duration: 1 day. Dental Procedure: Laser Teeth Whitening: USA Price: $496 USD vs Costa Rica Dental Prices: $330 USD | Procedure Duration: 1 day. Dental Procedure: Regular Teeth Cleaning : USA Price: $127 USD vs Costa Rica Dental Prices: $80 USD | Procedure Duration: 1 day. Dental Procedure: Teeth Whitening, take home kit : USA Price: $275 USD vs Costa Rica Dental Prices: $250 USD | Procedure Duration: 1 day. Dental Procedure: Composite Veneer (direct bonding) : USA Price: $250 USD vs Costa Rica Dental Prices: $230 USD | Procedure Duration: 1-2 days. Dental Procedure: Full Porcelain/Ceramic Crown : USA Price: $1219 USD vs Costa Rica Dental Prices: $500 USD | Procedure Duration: 5-10 days. Dental Procedure: Porcelain Fused to Gold Crown : USA Price: $1600 USD vs Costa Rica Dental Prices: $680 USD | Procedure Duration: 5-10 days. Dental Procedure: Porcelain Fused to Metal Crown (precious alloy) : USA Price: $1300 USD vs Costa Rica Dental Prices: $600 USD | Procedure Duration: 5-10 days. Dental Procedure: Porcelain Veneer: USA Price: $1872 USD vs Costa Rica Dental Prices: $470 USD | Procedure Duration: 5-10 days. Dental Procedure: Zirconia Crown: USA Price: $1600 USD vs Costa Rica Dental Prices: $555 USD | Procedure Duration: 5-10 days. Dental Procedure: Temporary Crown/Veneer : USA Price: $150 USD vs Costa Rica Dental Prices: $90 USD | Procedure Duration: 1 day. Dental Procedure: Zirconia Veneer: USA Price: $1400 USD vs Costa Rica Dental Prices: $350 USD | Procedure Duration: 5-10 days. Dental Procedure: Full Denture, Acrylic Teeth (upper or lower) : USA Price: $1800 USD vs Costa Rica Dental Prices: $735 USD | Procedure Duration: 5-10 days. Dental Procedure: Full Denture, Immediate or Healing (upper or lower) : USA Price: $1500 USD vs Costa Rica Dental Prices: $575 USD | Procedure Duration: 5-10 days. Dental Procedure: Full Denture, Porcelain Teeth (upper or lower) : USA Price: $1200 USD vs Costa Rica Dental Prices: $825 USD | Procedure Duration: 5-10 days. Dental Procedure: Partial Denture, Acrylic Frame : USA Price: $1400 USD vs Costa Rica Dental Prices: $415 USD | Procedure Duration: 5-10 days. Dental Procedure: Partial Denture, Metal Frame : USA Price: $1300 USD vs Costa Rica Dental Prices: $620 USD | Procedure Duration: 5-10 days. Dental Procedure: Temporary Partial or Flipper: USA Price: $450 USD vs Costa Rica Dental Prices: $300 USD | Procedure Duration: 1 day. Dental Procedure: Partial Denture, Flexible Frame: USA Price: $1400 USD vs Costa Rica Dental Prices: $495 USD | Procedure Duration: 3-5 days. Dental Procedure: Bone graft (large): USA Price: $2000 USD vs Costa Rica Dental Prices: $885 USD | Procedure Duration: 1 day. Dental Procedure: Bone graft (small): USA Price: $1500 USD vs Costa Rica Dental Prices: $335 USD | Procedure Duration: 1 day. Dental Procedure: Implant Supported Overdenture, removable (with 2 implants): USA Price: $6900 USD vs Costa Rica Dental Prices: $3030 USD | Procedure Duration: 3-10 days. Dental Procedure: Implant Supported Overdenture, removable (with 4 implants): USA Price: $12300 USD vs Costa Rica Dental Prices: $5595 USD | Procedure Duration: 3-10 days. Dental Procedure: Implant Supported Overdenture, removable (with 6 implants): USA Price: $17700 USD vs Costa Rica Dental Prices: $7520 USD | Procedure Duration: 3-10 days. Dental Procedure: Implant Supported Overdenture, removable (with 8 implants): USA Price: $23000 USD vs Costa Rica Dental Prices: $9925 USD | Procedure Duration: 3-10 days. Dental Procedure: Implants Supported Porcelain Bridge, Full Arch (with 4 implants): USA Price: $24000 USD vs Costa Rica Dental Prices: $10270 USD | Procedure Duration: 3-10 days. Dental Procedure: Implants Supported Porcelain Bridge, Full Arch (with 6 implants): USA Price: $28000 USD vs Costa Rica Dental Prices: $12225 USD | Procedure Duration: 3-10 days. Dental Procedure: Implants Supported Porcelain Bridge, Full Arch (with 8 implants): USA Price: $32000 USD vs Costa Rica Dental Prices: $14220 USD | Procedure Duration: 3-10 days. Dental Procedure: Mini Implant: USA Price: $1100 USD vs Costa Rica Dental Prices: $615 USD | Procedure Duration: 1 day. Dental Procedure: Sinus lifting: USA Price: $4000 USD vs Costa Rica Dental Prices: $1630 USD | Procedure Duration: 1 day. Dental Procedure: Standard Implant Crown (including abutment): USA Price: $3850 USD vs Costa Rica Dental Prices: $755 USD | Procedure Duration: 5 – 10 days. Dental Procedure: Standard Titanium Dental Implant (implant only): USA Price: $2200 USD vs Costa Rica Dental Prices: $835 USD | Procedure Duration: 3 – 7 days. Dental Procedure: Titanium Dental Implant (including abutment and standard crown): USA Price: $3900 USD vs Costa Rica Dental Prices: $1525 USD | Procedure Duration: 1 day. Dental Procedure: “All on Four” System with fixed acrylic bridge: USA Price: $20533 USD vs Costa Rica Dental Prices: $10240 USD | Procedure Duration: 1 day. Dental Procedure: “All on Six” System with fixed acrylic bridge: USA Price: $30000 USD vs Costa Rica Dental Prices: $12650 USD | Procedure Duration: 1 day. Dental Procedure: Post/Core Build-up: USA Price: $400 USD vs Costa Rica Dental Prices: $160 USD | Procedure Duration: 1 day. Dental Procedure: Root canal (molar): USA Price: $1350 USD vs Costa Rica Dental Prices: $350 USD | Procedure Duration: 1-7 days. Dental Procedure: Root canal (anterior tooth): USA Price: $800 USD vs Costa Rica Dental Prices: $290 USD | Procedure Duration: 1-7 days. Dental Procedure: Root canal (any tooth): USA Price: $1188 USD vs Costa Rica Dental Prices: $350 USD | Procedure Duration: 1-7 days. Dental Procedure: Root canal (premolar): USA Price: $1150 USD vs Costa Rica Dental Prices: $320 USD | Procedure Duration: 1-7 days. Dental Procedure: Root Canal Treatment (including post/core & standard crown): USA Price: $2200 USD vs Costa Rica Dental Prices: $960 USD | Procedure Duration: 5-7 days. Dental Procedure: IV Sedation (by anesthesiologist): USA Price: $2500 USD vs Costa Rica Dental Prices: $515 USD. Visiting Costa Rica for dental treatment will give you the chance to enjoy world-class dental care in a country rich with history. Costa Rica’s diverse terrain of jungles, beaches, volcanoes, coral reefs, mountains and hot springs are filled with an extraordinary abundance of plant and animal species, making this Central American tropical paradise a joy to visit for dental care. The friendly disposition of the Ticos – as Costa Rican’s call themselves – help make Costa Rica one of the most popular dental destinations, particularly for Americans and Canadians. By far, tourists from the United States make up the largest proportion of foreign visitors. Affordable flights taking as little as three hours prove an irresistible combination for Americans wanting to experience the tropics along with a dental treatment. For patients seeking high-quality affordable treatment in a destination suiting all tastes, lifestyles and budgets, Costa Rica ticks all the boxes. Costa Rica is located on the Central American isthmus, bounded by Panama to the south and Nicaragua to the north. Costa Rica enjoys two terrific coastlines: the Caribbean Sea to the east and the Pacific Ocean to the west. A tropical climate prevails all year round, particularly in the cooler hill regions. Why Visit a Dentist in Costa Rica? Excellent quality care: Our best Costa Rican dentists have been trained in the US and are likely to be members of the American Dental Association or accredited by one of the leading US or Canadian agencies. There are many Costa Rica dentists throughout who will offer you the same good quality of care that you would receive at home. Easy access: With numerous airline carriers offering flights just a few hours from major US and Canadian cities, coupled with reasonably priced fares, Costa Rica is one of the most convenient dental destinations for North American patients. This is doubly true if you need to make a return trip for dental implant work. Great Costa Rica Dental Prices: If you are among the millions struggling with the high costs of dental care at home, then Costa Rica could be just the place to get your dental health on track. Savings on most procedure range 40-70%. What is the cost savings for dental services in Costa Rica? American trained Bilingual Doctors and Highly trained staff with continuous Education and Permanent Studies. Implants. In some cases Implants can be placed with “a no Flap and no suture Technique,” in just minutes; a painless procedure saving our patients time and money. Ample experience in Oral Rehabilitation, Cosmetic Dentistry and other Dental Fields. In some Specific Cases Oral Rehabilitations –regardless of extension and difficulty- can be completed in one trip to Costa Rica, saving our clients a lot of time and money. State of the art dental facilities, with the most recent and efficient high-Tech Equipment. Patient Coordinators to assist or arrange all travel and lodging issues for International Patients. In many cases Free pickup from the Airport. 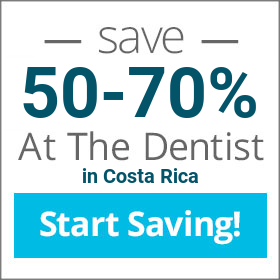 Did you know that the All on Four Dental Implants procedure applied in Costa Rica can save you up to 70% than if you practice at home? What are you waiting for to have that beautiful smile that you have dream off? Contact us today and let us help you smile again.